Glucocorticoids (GCs) are associated with fragility fractures in children with various chronic illnesses. 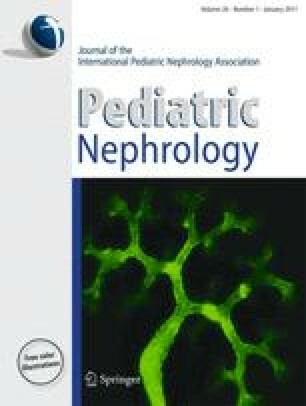 The impact of GCs on bone health in children with nephrotic syndrome (NS) is less well understood. Here we report skeletal findings in a 10-year-old boy with steroid-sensitive NS who presented with back pain due to vertebral fractures 5 years after NS diagnosis. Spine radiographs showed a Genant grade 2 fracture at T7 and a grade 1 fracture at T8. Dual-energy X-ray absorptiometry (DXA) revealed a lumbar spine areal bone mineral density (BMD) Z-score of −0.5 and a total body areal BMD Z-score of −0.4. Quantitative transiliac bone histomorphometry revealed low trabecular bone volume and cortical width but no osteomalacia. Our findings show the potential for significant bone morbidity due to osteoporosis in steroid-sensitive NS treated with intermittent GC therapy and emphasize that vertebral fractures may be an underrecognized complication. Furthermore, our report highlights that vertebral fractures can be associated with normal spine areal BMD in this context, suggesting that DXA-based, anteroposterior areal BMD should not be relied upon exclusively for assessing bone health and disease in children with steroid-sensitive NS. Dr. Sbrocchi is supported by a NovoNordisk Canadian Pediatric Endocrine Group Clinical Research Fellowship. Dr. Ward is supported by a Canadian Institutes for Health Research New Investigator Award and a Canadian Child Health Clinician Scientist Career Enhancement Award. This study was also supported by the Shriners of North America.